IHeart Organizing: IHeart: Abigail Lee & a GIVEAWAY! 386 IHeart: Abigail Lee & a GIVEAWAY! One of my favorite types of gifts to give is something that is personalized. I love that it shows the person just how much they matter, and that you put a little extra thought into their gift. My friends over at Abigail Lee know all about the impact and importance of personalization, like it's their job! Wait, it IS their job! That is right! They carry anything awesome that one might need or want to give, from IPad cases, decals and Kindle sleeves to beautiful trays and cutting boards, these folks have it all! 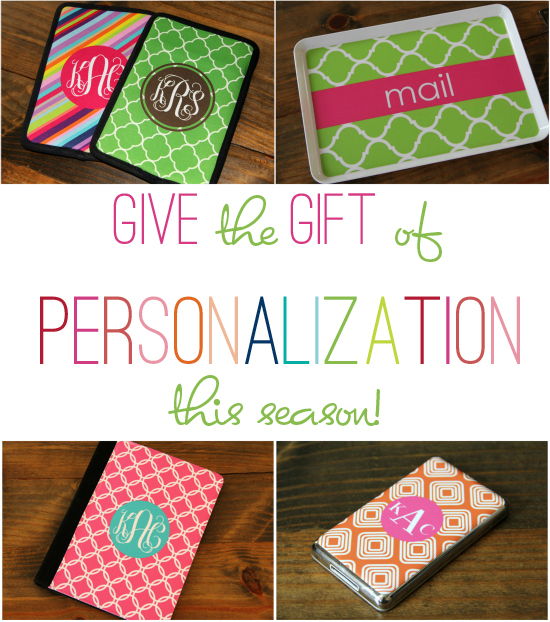 You know I am a sucker for beautiful bold colors and monograms/labels, so Abigail Lee makes their way right onto my list of favorite stops for the gift giving season! 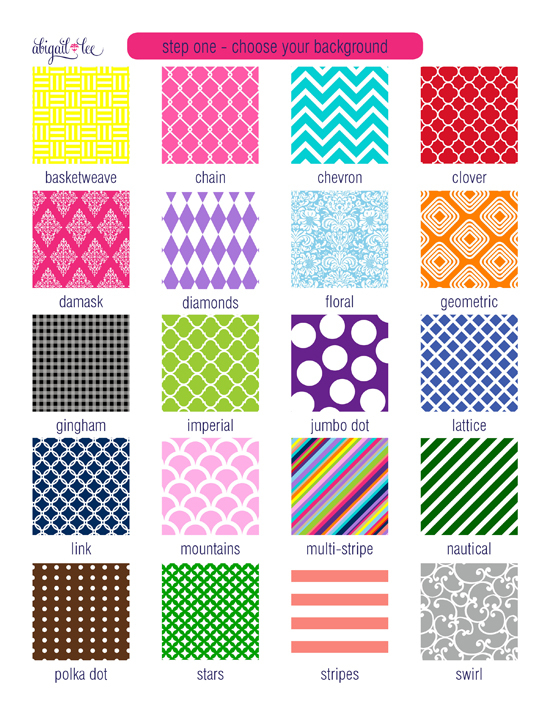 Just check out all of these lovely customizable patterns and colors. I adore! Those sweet friends are also in the giving mood! Two lucky readers are about to snag themselves a $50 gift certificate to be used at AbigailLee.com! Abigail Lee is offering a 15% discount to IHeart Organizing readers, just enter IHEART15 at checkout through 11/30/12. It's good for your entire purchase from AbigailLee.com! They also do custom orders, which includes custom colors! Just pop over an email to orders@abigaillee.com for custom information. Awesome giveaway! The most thoughtful gift I have ever been given was a CD my husband made for me. He went to a recording studio and recorded a song he wrote about our son on it. A great gift for me and for our son! I love the quilt my mom sewed for me last year. Thank you for the chance to win! When I was a little girl, the one thing I wanted more than anything was an American Girl doll. But my parents never bought me one. When I turned 18, my best friends bought me the Kirsten doll as a surprise. It was such a great gift! The most thoughtful gift I've ever been given was a charm with a picture of my husband from when he was a little boy. My mothernlaw recently gave it to me after our family had been having a rough year. Tears instantly. I am loving all the phone cases... So fun! The most thoughtful gift I've ever received was a bracelet engraved with a special name that only my hubby calls me. Well at the time it was given he was a very special friend! The most thoughtful gift I received was a necklace from the BF. My mom gave me a t-shirt quilt from with my camp t-shirts last Christmas and it made me cry! Oh I love the iPhone cases!! My most thoughtful gift was from my great aunt who always hand-made blankets for family members. She made it out of my favorite colors, and then gave it to my mom who quilted it by hand. I loving gift from two very important women in my life! I'm in love with that mail tray! My most thoughtful gift I got was two years ago my husband gave me a James avery charm bracelet but with it he wrote a poem that described why he chose every charm. It was so sweet and romantic!! One of the most thoughtful gifts from my husband was a special roller-ball mouse (since I have wrist problems). SQUEALSIES! I've been dying for a cell phone cover! Most thoughtful gift was from my husband (then fiance). He created a multistep hide/seek game to find my gifts. It was so well thought out. The most thoughtful gift I ever received was a little box filled with little hand cut out hearts with a word on each describing something my husband loves about me. I'm in love with her Iphone covers and cutting boards!! Thanks for the giveaway. Cool giveaway. Love the iphone covers !! oh, and the Best gift I ever received was a horse! I liked Abigail Lee on Facebook! I love all the little thoughtful hand-made gifts I get from my students!! I've been wanting one of those iPhone case for months! Oh dear, I guess I didn't read all the instructions. My most thoughtful gifts are definitely notes from my husband. One of the most thoughtful gifts I've received is a sewing machine from my mother-in-law. I copied an entire story for my mom, one that we couldn't find to buy. She loved it. I love all the handmade gifts from my son. Everything he makes me is so sweet & thoughtful! These are adorable. The colors and patterns are wonderful. Fun, fun, fun! I got a Beatles 65 album from my dad (in 1965!) for nothing, no holiday, birthday, anything. It was the first time I realized you could give gifts for no reason except that you love the person. Still my favorite gift ever! My most treasured gift was a love letter my husband wrote me on our wedding day! Right now? My friends are bringing me dinners every other day because I have mono and have been fighting it since August. A mom of 2 does not REST! =) So thankful for my friends gifting me their time, talents, and delicious food! A framed family photo - my fav. The most thoughtful gift was for my 22nd birthday--my husband proposed! The most thoughtful gift I've received is the hand of friendship extended to me. A few times over the years my best friend (who's a very masculine man!) has bought me makeup when I've had the blues. He gets me very girl-y, sparkly-type items, knowing I would never spend the money on pretty things for myself. Just picturing him browsing the make-up department, picking colors, etc...is a gift in itself. He's the greatest friend ever! My most thoughtful gift: all of them; I just can't choose. The best gift I,ve ever received was an egg from my sister. My son is now 18 years old! Beautiful products. Most thoughtful gift was from a patient who knitting an ornament at Christmas. So sweet! I absolutely love all of the themes/patterns for the iPhone covers! What a great company! OOhhh I love all these personal little touches. With the holidays coming up this would be a great gift for my sis or SIL. Thanks! I'm giving my parents a drawing made form a picture of our river house this year for Christmas. They are going to love it! I love all the bright colors! Thank you! the best gift i ever got was when my daughter was about 2. we were going through a real rough patch with her and a elderly lady friend came and put her arms around me when i had reached the end of my rope and told me what a good mom i was. that really helped me through. i'm tearing up just remebering it. Awesome! I can't believe I haven't heard of them before! Most thoughtful gift ever was from my husband last Christmas he got me a gorgeous necklace with my daughters name on it! My husband made a scrapbook of our first year together. He saved random notes and ticket stubs and such. It was incredibly thoughtful. I love the handmade gifts from my daughter. She gives with such enthusiasm and makes whatever it is such a treasure! The most thoughtful gift I ever received was a subscription for monthly flowers from a local greenhouse from my husband. The flowers came every month, to my desk at work, for 6 months. He knows how much I love to receive flowers and my work was very stressful, so it was the perfect gift! It also supported a local business that operated in a very "green" way, so it checked two more boxes for me, too! The most thoughtful gift I have received was a painting from my husband in August for our first wedding anniversary. He went on Pinterest, found some art I liked, and then DIY-ed some abstract art while I was at work one day and hid it until our anniversary came. I kept checking the back for the designer before he told me that he had painted it! So sweet! When my first son was born, my husband bought a ring that he knew that I loved. I had no idea he even listened to me when I told him that I liked it, so it was complete surprise! My most thoughtful gifts are things I've received after mentioning in passing that I liked them. It's sweet that someone was paying attention and remembered what we had talked about. They could be for little things - like one of my friends overheard me say I like funky-colored socks and bought me a bundle of them for Christmas. The stuff you are showing has really cool colors and patterns! love them! I'm always looking for a great 'personalized' company to provide such items as gifts. Lots of weddings/babies in the next year - they will be fabulous - thanks for showcasing! Love this! 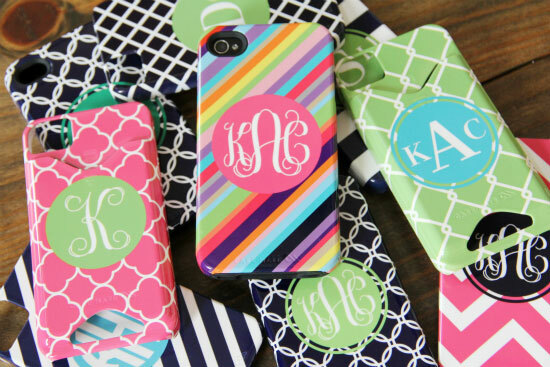 Anything monogrammed immediately gets my attention. The most thoughtful gift I have received was from my Dad, he carved me a nativity out of soap just like the one he made for my mom when they were firts married. A painting from my niece. I watched her work on it forever until at the end she finally revealed it was for me - so sweet! I was in Texas and visited the Houston livestock show. There was a booth that took old saddles and put floral arrangements in them. They were so cool but came with a $500 price tag.I mentioned it to my MIL and she found me an old saddle for my birthday. I can't wait to finish it and hang it on my wall. My now husband gave me a message in a bottle when he was deployed overseas. So incredibly thoughtful! When I was pregnant during Christmas 2010, my husband bought me a gorgeous sliver necklace that is actually a teething ring. It was such a thoughtful gift and I love it! I love the phone covers! I've been needing a phone case ever since I got my iPhone for Christmas last year! This is exactly the kind of case I'd LOVE to have! I love the melamine platter! So cute! Love the iPhone cases! My husband once gave me a desktop-flip every page-calendar for an anniversary. Every single page had something on it about what he loves about me or a happy memory. The most thoughtful gift I ever received was a picture from the island where we met. Last year for my sister's 30th birthday I gave her a collection of things that she loves/were sentimental. A box of Snuggle dryer sheets (she had a snuggle bear birthday party when we were kids). A giant bag of gummy bears, like 6 pounds (bear is her favorite shape of food). A day planner and a pack of her favorite pens. All very random things but she knew I had put lots of thought into getting her things she would love. The last gift my mom gave me before she passed away was a big tub full of table decorating supplies. It was so thoughtful and well put together. I still use it and often tear up a bit when I go to get it. My most thoughtful gift was my engagement ring. My husband asked my parents blessing and they offered my Mom's engagement ring for him to reset the diamond. His mother offered diamond earrings so now my ring unites both families. I couldn't believe how thoughtful it was! The most thoughtful gift I've GIVEN recently was to a mama-to-be at her baby shower. In addition to an adorable gift from her registry, I gave her a gift certificate to a local spa - she deserved to be pampered! usually the things that take the most time are thoughtful special gifts to me. if i know someone spend their time and talents on something i am more likely to appreciate it. My most thoughtful gift was my wedding gift from my husband... a dog named Eddie. He was the best! The most thoughtful gift I have ever received was a handmade scrapbook from my husband back when we were dating. He put a lot of time and work into it! The most thoughtful gift I ever received was from my brother last year when he got my fiance and I an ipod dock because he noticed when visiting months prior that the dock we had was total crap. It's a toss up between the quilt we got for our wedding and the shadow boxes someone made for us with lots of wedding 'stuff'. They both meant a lot to us. The patterns are so bright and cheery!!! Love everything! The most thoughtful gift I ever received was last valentines day my then boyfriend (now fiancé) made me a dozen roses out of bacon and filled the bottom of the vase with white chocolates. I'm not huge on real flowers and dislike regular chocolate. I also have a bit of an obsession with bacon so this was an incredibly sweet and thoughtful gesture. I would love to receive a personalized gift from Abigail Lee. Everything is so beautiful. The most thoughtful gift I have ever received was a beautiful necklace on Valentine's Day! The most thoughtful gift I ever received was when my husband and I were poor and young new parents. My parents gave us free movie tickets and dinner out while they watched the baby. That was perfect! The most thoughtful gift I've received has been free baby-sitting from my son's godparents so my husband and I can go out on a date every once in awhile. Hmmm, I think of one of the most thoughtful/favorite gifts I've received is my mother's charm bracelet. It's so fun and reminds me of her. The best gift I ever received was ultrasound pictures of our first baby on our one year wedding anniversary! A night away in the Rocky Mountains for my birthday after a difficult, tiring month. The best gift I received was a guitar from my husband. I'd been learning for a year on a guitar I borrowed from my friend, but we were moving away and he knew I wanted to continue to play. Made me cry! It's hard to say what the most thoughtful gift has been. I have awesome friends & family & have been through a few surgeries in the past & they have always been there for whatever I needed, whether bringing food or helping drive my daughter around when I wasn't able, or just surprising me with something to help with boredom or my favorite drink. I am very blessed with thoughtful people in my life! One of my favorite gifts I've received recently is a monogrammed Moon and Lola neckalce! love it!! My husband made me a beautiful photo album for our first anniversary. I'll always treasure it! So cute! My dad gave me a watch for my last birthday to help time my contractions (my baby girl was due the next month)--so thoughtful! Love these fun patterns! My sister gave us a lazy susan filled with wine corks from our wedding. Love it! My boyfriend and I were long distance for a summer when I was in Brazil, and the fall after I got back he had all of our emails back-and-forth bound into a book. I'm such a sap, I still tear up every time I flip through it! When I was 12 a family member gave be a beautiful jewelry box for my birthday. It's ten years later and I still display it. It's just timeless! love, love, LOVE! i am a sucker for all things monogrammed! My mom gave me a personalized diary when I was 12. She wrote the first entry...it was the most thoughtful gift and I still treasure it today! The most thoughtful gift I have ever received is definitely from my husband. We were on our way to Minneapolis for "Gotcha Day" - the day we would pick up our son (we adopted him when he was 8 months). We had stopped to grab a quick bite to eat on the south side of the Cities when he was like, "Oh! Look under your seat!" and when I did, I found a lovely jewelry box with a perfect bow (done at the jewelry store). When I opened it, there was a Mother's necklace and a promise to add our son's birthstone. We only had 3 days to prepare for him, so he just didn't have time to have it added in advance. The emotion of that day brings tears to my eyes every time I think about it! My parents gave me a watch for my 21st bday. That was 21 years ago. My mom has since past away. The watch will always be near and dear to me. I have had to have the insides replaced because of the age...cost me more than a new watch, but well worth it. I"m pretty sure I need one of those iphone cases. they are GORGEOUS! The most thoughtful gift I received was from my husband. While we were dating he gave me a box of my favorite things...one of those things being a huge box of Swiss miss hot cocoa! My fiancé handmade Valentine’s cards with his favorite literary references to love… and he had such a hard time picking one, he made half a dozen! There were so sweet and so thoroughly thought out. He’s a keeper! I once got a big bag full of fun trims. great gift for a sewer. I love when my boys make me special gifts at school in art class. They are so thoughtful! A gift certificate to my favorite craft store from my then future brother-in-law. When I got married, my mom got all the important women in my life to share their favorite recipes and she compiled a cookbook. Most thoughtful gift I've received to date... when we were newly married, my husband went to Origins after studying the contents of our bathroom and bought me every skin-care/cosmetic product I was low on. I was really touched by the time he took to find out what my favorite things were. Shortly after my husband and I were engaged he brought me a bouquet of tulips with a hundred dollar bill rolled up and stuck in the middle so that I could go shopping for some new clothes! love these!!! What a GREAT GIFT! I got a piece of my great grandmothers wedding ring when she passed. What a wonderful giveaway! I think the most thoughtful gift I've ever received is a hand made scrapbook of my son, pictures included! It was so nice to have someone else put it together and it's one of my most favorite items. The most thoughtful gift I ever received was from my sister...I just had to have surgery to get my gallbladder removed and my sister sent me a $100 e-gift card to Gap because she said she knew I would be stuck in bed and would need something to do like shopping! So sweet! The most thoughtful gift someone has given me was a necklace. My mother gave me the necklace she had worn at her wedding so I could wear it at mine. In all honesty, it was a very cheap 31 year old necklace. But it meant everything because it was now a family piece. I once gave my husband a home-made book telling the story of him opening his present. The book described him, learning that I was flying his best friend out to see him a few days from then, and they were both going to a football game together. It took him a minute to realize that his gift wasn't the book, but that he was going to a pro-football game with his best friend. His stunned reaction was priceless. Hope I win this! I will get something cute for my sister for university :). My most favorite gifts have been handmade scrapbooks. They take so much time and love! I've never heard of this company, but it looks like my kind of place! The most thoughtful gift I recieved was a sewing machine from my family. Awesome giveaway! I'd love to use this for Christmas gifts! The most spectacular gift ever was when my now-husband gave me a bracelet engraved with "amor vincit omnia" - latin for "love conquers all." We were in a long-distance relationship and I was really struggling. It has been six years and I've never removed the bracelet. The most thoughtful gift I've ever received was a recipe book filled with all of my family's favorite recipes, plus some of my husband's favorites from his childhood. The most thoughtful gift was a chipboard recipe book that my mother-in-law made that had pictures of my husband's family members and their favorite recipes. I see a lot of people putting recipe books down, and I have to join that group. My mom put all our family recipes in one binder, and I love it and use it almost daily! The most thoughtful gift I've received was a special piece of pottery that I collect. I took all our home family videos that were on VHS, compiled them and turned them into DVD's as gifts. When my daughter was in elementary school, every year for my birthday she would make me a birthday card and have all her classmates sign it. I love to know that she thought of me during school. The most thoughtful gift I received was last week from my friend, who showed up at my house to recover my bar stools for my birthday. Love! I loved a handmade card I received. I love the iPhone cases. So pretty! A monogram always makes me smile. THe most thoughful gift I received was 3 nights of overnight babysitting to be used at anytime throughout the next year. My kids loved the overnights at grandma and grandpa's, and my hubby and I had great dates! The most thoughtful gift I've received was from a coworker. A few of the girls in the office were engaged, so she took us out for a day to celebrate. She rented a limo, had champagne and sweets, took us to a boutique to try on dresses, a bakery to taste cakes, and then a salon for mani-pedis. It was the most generous and unexpected thing anyone has done for me. The most thoughtful gift I have received was photoshop elements. I know that sounds stupid, but let me explain. I LOVE photography - more specifically I love taking photos of my family and friends and details and...well you get the idea. Anyway, I didn't have a good photo editing software that could help take me to the next level and I always got frustrated after a shoot because of this. So my husband actually surprised me (it usually isn't possible) with Elements at Christmas last year, even though we really couldn't afford it. I was so surprised and touched that I actually cried. Over Photoshop. I am not even a crier. I know, ridiculous. As a wedding gift, my mom made me 2 scrapbooks covering my showers, rehearsal, getting ready, the big day, and my honeymoon. The books are beautiful and something I will always treasure. On our wedding day, my husband gave me a pair of pearl earrings to match my late grandmother's pearl necklace. I wear those earrings almost daily; they mean so much to me. One of the most thoughtful gifts I have ever received was from my brother-in-law. (really!) My childhood toys were destroyed in a fire when I was 18. Among the things was a handmade babydoll crib I was saving for when I had little girls. Years later after I was married and my first little girl was born my brother-in-law made me another babydoll crib almost just like the one I had as a little girl! With my name engraved in the wood and all! Both of my girls played with that when they were little and it will definitly be passed down! Thanks for the chance to win and the trip down memory lane. My dad has made all the girls in the family cedar chests and it's my most cherished gift! He put so much work into making them! The most thoughtful gift I have ever received was a necklace with an owl charm. My friend found it in a store days after my sister died. My sister crocheted little owl hats for babies and it had almost become a signature of hers. I wear that necklace almost daily! The most thoughtful thing I have done was getting my Mother a new car several years ago. She had been driving a 20 year old unsafe car with rust falling off it and I was lucky enough to have a windfall and used it all and surprised her on Xmas day. It changed her life...she feels safer, more confident and not embarrassed around friends. Best thing I have ever done. It would have to be my pandora bracelet with charms for my two kids that was given to me by a friend after I have my son. I love it! On our first anniversary my husband wrote a letter to me in a notebook. Now on every anniversary he writes another letter in the same notebook. I love that he does that for me every year! I literally JUST joined the 21st century of phones and finally got an iPhone. If I could get a super cute case for it, well, that'd be just swell! The most thoughtful gift I've received as my digital camera. I hope that one of my cousin favorites will be the gift I am giving her this year. I know when I was at the craft show last week and saw pens made from the handle of a knife I had to do this. I bought my Aunt's Box of silverplate flatwear after she passed this spring, in the box was a broken knife. I am having a pen made from the hollow handle for her. She was glad to know that I had her silver since it was used at all the holiday meals her family had. Now she will still have a piece of the silver to reminder of all he holiday meals celebrated with her family and it will be more useful to her than a chest of silverwear she would never polish and use. For me it was a picture frame with a picture of my little girl from my husband. i've never been big on monograms but i love this stuff! i think i need to monogram everything now! Best gift I ever received was my diamond earrings on my wedding morning from my husband! I purchased a watch for my then boyfriend.... we were soon engaged and got married later that next year. He still wears it every day almost 10 years later! would love to win! these would make such great gifts for my sisters! I think mine was my gift my husband got me after I delivered our son. We got some gorgeous personalized gifts after our daughter was born. Best gift ever, and totally unexpected... my great grandmother's piano. She loved to play the piano. Her love to play has been passed down through 4 generations, and now I'm teaching my daughters as well. My favorite gift that I have ever received was from my husband. When we were dating he gave me a frame with the first five photos of us together. The most thoughtful gift I have ever received was from my husband. He hired a maid to come in and deep clean the entire house for me. It was great!! I am having a hard time thinking of the most thoughtful gift I've received. Probably my parents gifting me with not only money for a spa day, but babysitting for my kids so that I could actually USE the gift! When we had almost no money, my husband got 4 pairs of my shoes fixed at the cobbler, so it was like getting 4 new pairs of shoes! Those sure are some beautiful colors. Thanks for sharing this giveaway with us. The most thoughtful gift I've ever received was a photo album of my life through high school given to me by my parents during my senior year. Thanks for the giveaway!